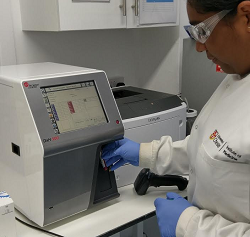 THE first Beckman Coulter DxH 500 haematology analyser in the UK has been installed at the University of Chester’s Institute of Medicine, for use in post graduate clinical research projects. Designed for low-volume workloads of up to 60 samples per hour, the DxH 500 offers a full blood count with a full five-part white blood cell differential. This haematology analyser needs just 12ul of whole blood to provide accurate results, says the company. This small volume, obtainable from a finger-prick, makes the device suitable for use with paediatric and geriatric patients who may be less able to provide large sample volumes. Re-tests can be made without collecting a further sample. “We are especially pleased that the DxH 500 offers full five-part diff, which enables even more scope for our research,” said Jasmine Stanley-Ahmed, lab technician at the University of Chester Institute of Medicine. “We needed an analyser that was reliable and simple to use by research students, while still able to provide comprehensive results for in-depth clinical research projects using both whole blood and cell separations. “Ease of use was a key deciding factor in our selection, and the DxH 500 requires only minimal training, so it’s simple to cascade the training to new users”. The DxH 500 system is 27cm wide including inbuilt touchscreen monitor, and so requires little space on the laboratory bench. It requires just two analytical reagents and a cleaner, and Beckman Coulter says it uses up to 50% less reagent than other low-volume analysers with hundreds of tests using a single bottle of non-toxic reagent.